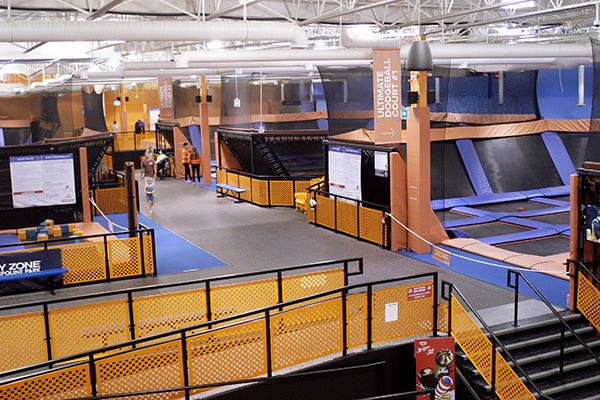 Skyzone Trampoline Park offers a monthly night for kids with special needs to come and jump with friends and family. Aug. 11, 2016 11:00 a.m.
Miriah Steele (right) hams it up with her friend Makenna Neish in the foam pit at Skyzone Surrey. On the third Monday of every month, Skyzone Trampoline Park in Surrey holds its special needs sensory-friendly night for children and adults with special needs. To accommodate people with autism and other sensory issues, Skyzone turns down the music and swaps the hand dryers in the washrooms for towels, while the referees leave their whistles at home and explain the rules using pictures. Skyzone, which opened its Surrey location in March 2016, began its sensory-friendly night in April to coincide with Autism Awareness Month. The night was started with support from the Canucks Autism Network, who helped train Skyzone staff on handling kids with sensory issues, and Reach Child and Youth Development Society. For that initial month, sensory night was held every week. Since then, the night has been held on the third Monday of every month. Jumpers with special needs pay half price ($8) for 60 minutes of trampoline time and a parent or caregiver can accompany them for free. Sarah Epp, events and community manager at Skyzone Surrey, says the nights have been a big success, with many families who came in April returning month after month. Tara Steele first learned about sensory night through an autism Facebook group during Autism Awareness Month. She and her husband Mike brought their daughter Miriah all the way from the family’s home in Langley to her first jump session the second week in April, and the family hasn’t missed a sensory night since. Steele says the nights are great for families like hers because they meet the needs of the kids.“It’s not as busy and [it’s] a lot quieter. It’s an accepting environment because everybody here gets that our children don’t cope with things as well as the average child, so it’s a good way to get some exercise and it’s a fun family activity,” Steele said. Epp, who also works with children with special needs and learning disabilities as an educational assistant in the Surrey School District, says some of Skyzone’s clients have been referred there by therapists as a way to get them moving and active in a safe and controlled environment. “For some jumpers it’s been beneficial [and] they’ve done it instead of therapy sessions, whereas others it’s just a fun family time for them,” Epp said. “It’s something that maybe their sensory child loves to do at home on their own time with their trampoline, so here it’s just a way that they can do it on a larger scale. From the jumpers that I have worked with on a personal level through the school district, a lot of them enjoy movement and so this is kind of the best place for them to really move and get that energy out. ”The next sensory night at Skyzone Surrey is Aug. 15. For more information visit skyzone.com/ca/surrey or phone 778-395-5867.